Today is the day after Thanksgiving. There are many things to be thankful so I decided to write a short post today. The first thing to be thankful is that Tomislav and I have completed the third edition of our MDX book, MDX with Microsoft SQL Server 2016 Analysis Services Cookbook. The book is published by Packt Publishing and has been uploaded to all the major publishing channels. The second thing to be thankful is the enthusiastic audience who have been faithfully reading my posts. I recently received two inquires, which are somehow related. One reader was a bit confused by what I said about the SQL NULL values and what I said about being careful of what we put in the WHERE clause. Another reader is from Deskbright.com, a new online learning platform. Deskbright.com offers a number of free online resources to help people learn business skills — such as SQL. They are wondering if I’d be willing to post a link to their page on SQL interview questions (https://www.deskbright.com/sql/sql-interview-questions/) on my site. As I am browsing through the SQL interview questions on deskbright.com, I see the #3 question, “Why is this query not returning the expected results?”, and thought this is perfect for the question from the reader I mentioned previously. Instead of overwhelming readers, deskbright.com listed only 7 most common SQL interview questions. I’d rather not to repeat what they have and would recommend their SQL interview questions to those of you who are still new to SQL or Business Intelligence. The full title of the book is MDX with Microsoft SQL Server 2016 Analysis Services Cookbook. By the time you see this post, the book should be on Amazon, PacktPub.com, and all other online technology book stores and the e-subscription sites. Putting the dynamic totals on top or at the bottom can be a trivial or a big decision. Very often, visual tools reply on MDX queries to get the aggregation correct in the MDX query so that the need to aggregate in the visual tool is eliminated. Suppose you need to display the sales for just Accessories and Clothing, and on the top you just want to show the aggregated sales value for Accessories and Clothing, as shown in the following example. VisualTotals() function is a good choice to display the aggregated values for the result set (“visual” here implies that the aggregation will be only based on the visually seen results, not based on the entire cube space). The VisualTotals () function will allow you to show the totals on top or at the bottom, depending on where you put the All member. This query using the VisualTotals () function will display the visual total on top. This is because the All Product member was the first in the named set. Now the visual total is shown at the bottom. As a matter of fact, you can display the totals anywhere. Try putting the All member in the middle, you will get the totals in the middle of the result set. I’ve seen MDX queries that used the Hierarchize() function for the only purpose to put the visual totals at the bottom, using the POST options. When using the POST option, the Hierarchize function sorts the members in a level using a post-natural order. In other words, child members precede their parents. Therefore the dynamic totals are at the bottom. If there is only one level in the result set, I don’t see the need to use the Hierarchize function since we can position the dynamic totals at the bottom by simply rearranging the set. After I posted this blog MDX Cookbook is a popular book, I received another email from my MDX book publisher. Considering the enormous response we received for the last promotional campaign that ended on 12th March, would you be willing to continue the offer (50% OFF on the eBook of MDX with SSAS 2012 Cookbook) until mid-April? If yes, let me know the size specifications and I will send you the banner. I am very happy to give my readers another banner for 50% discount on the MDX with SSAS 2012 Cookbook until mid-April. We use NON EMPTY key word on the rows axis to remove rows with NULL values. It works only when all the measures are NULL. If any one of the measures has value, NON EMPTY key word will not be able to remove rows. A co-worker recently worked on getting 30+ measures from multiple measure groups out from our production cube. The NON EMPTY key word on the rows axis worked as expected. This [Measures]. [Period Key] is then added to the columns axis. The query at the point returns rows that more than doubled what it returned before with many of them showing all measures NULL, except the Period Key. The NON EMPTY is obviously not working at this point. When you think about it, this actually makes sense. In the context of the query, the Period Key has value and should be the same for all the employees whether those measures are NULL or not. This explains why NON EMPTY cannot remove the rows even when all the measures are NULL, since [Measures]. [Period Key] has value. Below is a made-up example. It shows that we get rows back even when all measures are NULL. The NONEMPTY() function is a lot more flexible and should work in this case. But the usual form of it, where one measure is given as the second parameter, would not work in this case. We need to check for all the 30+ measures. The solution here is to use a named set as the second parameter. Putting all together, here is the final query that will only return the employees who have values in those 30+ measures. In my made-up example, only the two rows that are in red and bold will be returned, Baker, B and Brooks, W.
It implies that the second parameter is optional. Check out my old blog to understand why we should always provide set_expression2 in the NonEmpty() function. The OLE DB provider “MSOLAP” for linked server “CUBE_LINK” indicates that either the object has no columns or the current user does not have permissions on that object. When using linked server or writing MDX queries in SSRS reports to pull data from OLAP cube, consider removing the NON EMPTY key word on COLUMNS. When there is no data in the result set, the NON EMPTY key word on COLUMNS will not return any columns. The linked server will send “object has no columns” error and the OPEMQUERY will fail. Unless you truly want the OPEMQUERY to fail, consider removing the NON EMPTY key word from the COLUMNS axis. Removing the NON EMPTY key word from the COLUMNS axis will allow the MDX to return the columns even when the query contains no data. There are many tips in the book MDX with SSAS2012 Cookbook about how the NON EMPTY key word behaves. Since the book is organized not by MDX functions, but rather by subject areas, the best way to find these tips is to use the Index at the back of the book to find examples and tips in the book. I cannot believe that I have not posted any blog since May 2015! It’s been a busy few months for my co-workers and I, working on an OLAP re-design project. From the re-design of the ETL processes, to the multi-dimensional model, to building the dimensions, measure groups and cube, to the hundreds of pages of MDX calculation scripts, I’ve learned so much in the last few months. Not mentioning converting all the SSRS reports in MDX queries, which is the part I enjoyed a lot. MDX is not the only skill that BI/data warehouse developers need, but it’s without doubt, many find that it is a very difficult skill to master. On the other hand, MDX is a pretty easy skill to pick up. Tomislav Piasevoli is a master in MDX. His insight in MDX will bring you from a beginner to an experience MDX writer. It is such a privilege for me to bring the original one in SSAS 2008 to SSAS 2012. If your work touches OLAP, you need to know something about MDX. One BI/data warehouse developer once said to me that MDX books are so few that he bought every (almost) MDX book on the market. Among the few MDX books available, MDX with SSAS 2012 Cookbook is a popular book. While working on our OLAP re-design project, writing MDX calculation scripts, and converting SSRS reports in MDX queries, my co-workers and I often consulted the MDX Cookbook. I encourage you to take advantage this one time discount. The 50% discount (with code MDXAS50) can only apply to the eBook version, and is valid through March 12, 2016. I know many of us still prefer the paper book. But the discount is hard to beat. The book MDX with SSAS 2012 Cookbook has many great tips for MDX script writers. MDX script writers frequently need to include or exclude a particular member in a calculation. The first step is to determine the member exists in a hierarchy. The book provided great recipes on how this can be done in MDX queries. In this blog, I’ll focus on how this can be done in MDX scripts. 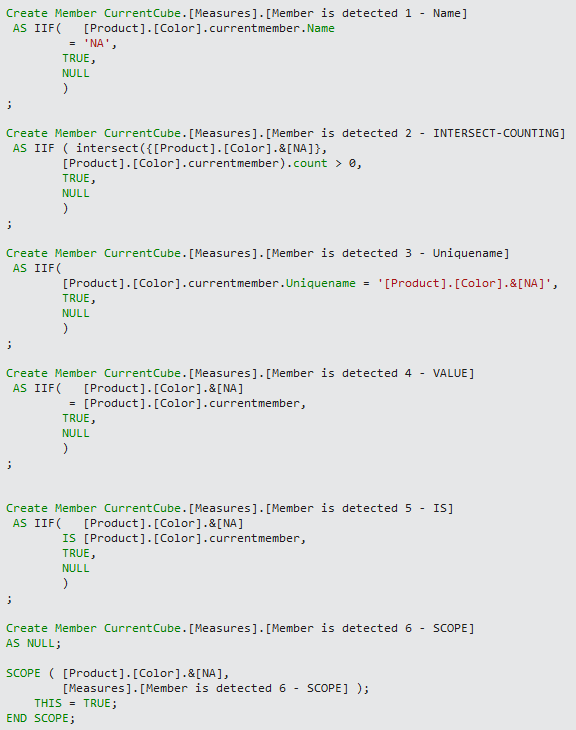 Suppose that we need to detect the NA member in the Color hierarchy of the Product dimension. The result should show us TRUE for color NA only. Here are 6 different ways it can be done in MDX script (there are more ways if you insist; see the screen shot below). The solutions are increasingly better from 1 to 6, with number 1 being the worst, and number 6 much better. Avoid number 1 and 2; Number 3 is similar to number 4 and 5; Number 6 is a better choice in MDX script. Chris Webb did a wonderful job in this “Fun with Scoped Assignments in MDX” video.